Diana, Princess of Wales,Diana, Princess of Wales (Diana Frances; née Spencer; 1 July 1961 – 31 August 1997), was the first wife of Charles, Prince of Wales, who is the eldest child and . Princess Diana - Princess, Children's Activist,Princess Diana, Princess of Wales, was one of the most adored members of the British royal family. Iconic gay bar which 'Princess Diana visited with Freddy Mercury' is saved after ministers make it listed building. MARTIN BASHIR: Your Royal Highness, how prepared were you for the pressures that came with marrying into the Royal Family? DIANA: At the age of 19, you always think you're prepared for everything, and you think you have the knowledge of what's coming ahead. But although I was daunted at the prospect at the time, I felt I had the support of my husband-to-be. BASHIR: What were the expectations that you had for married life? DIANA: I think like any marriage, specially when you've had divorced parents like myself, you'd want to try even harder to make it work and you don't want to fall back into a pattern that you've seen happen in your own family. "I want to reassure all those people who have loved me and supported me throughout the last 15 years that I'd never let them down." I desperately wanted it to work, I desperately loved my husband and I wanted to share everything together, and I thought that we were a very good team. BASHIR: How aware were you of the significance of what had happened to you? After all, you'd become Princess of Wales, ultimately with a view to becoming Queen. DIANA: I wasn't daunted, and am not daunted by the responsibilities that that role creates. It was a challenge, it is a challenge. As for becoming Queen, it's, it was never at the forefront of my mind when I married my husband: it was a long way off that thought. The most daunting aspect was the media attention, because my husband and I, we were told when we got engaged that the media would go quietly, and it didn't; and then when we were married they said it would go quietly and it didn't; and then it started to focus very much on me, and I seemed to be on the front of a newspaper every single day, which is an isolating experience, and the higher the media put you, place you, is the bigger the drop. And I was very aware of that. BASHIR: How did you handle the transition from being Lady Diana Spencer to the most photographed, the most talked-about, woman in the world? DIANA: Well, it took a long time to understand why people were so interested in me, but I assumed it was because my husband had done a lot of wonderful work leading up to our marriage and our relationship. But then I, during the years you see yourself as a good product that sits on a shelf and sells well, and people make a lot of money out of you. BASHIR: It's been suggested in some newspapers that you were left largely to cope with your new status on your own. Do you feel that was your experience? DIANA: Yes I do, on reflection. But then here was a situation which hadn't ever happened before in history, in the sense that the media were everywhere, and here was a fairy story that everybody wanted to work. And so it was, it was isolating, but it was also a situation where you couldn't indulge in feeling sorry for yourself: you had to either sink or swim. And you had to learn that very fast. BASHIR: And what did you do? He said, `Well, you've got to do it.' And he went off and did his bit, and I went off and did my bit. It practically finished me off there and then, and I suddenly realised - I went back to our hotel room and realised the impact that, you know, I had to sort myself out. We had a six-week tour - four weeks in Australia and two weeks in New Zealand - and by the end, when we flew back from New Zealand, I was a different person. I realised the sense of duty, the level of intensity of interest, and the demanding role I now found myself in. BASHIR: Were you overwhelmed by the pressure from people initially? DIANA: Yes, I was very daunted because as far as I was concerned I was a fat, chubby, 20-year-old, 21-year-old, and I couldn't understand the level of interest. BASHIR: At this early stage, would you say that you were happily married? DIANA: Very much so. But, the pressure on us both as a couple with the media was phenomenal, and misunderstood by a great many people. We'd be going round Australia, for instance, and all you could hear was, oh, she's on the other side. Now, if you're a man, like my husband a proud man, you mind about that if you hear it every day for four weeks. And you feel low about it, instead of feeling happy and sharing it. BASHIR: When you say `she's on the other side', what do you mean? DIANA: Well, they weren't on the right side to wave at me or to touch me. BASHIR: So they were expressing a preference even then for you rather than your husband? DIANA: Yes - which I felt very uncomfortable with, and I felt it was unfair, because I wanted to share. BASHIR: But were you flattered by the media attention particularly? DIANA: No, not particularly, because with the media attention came a lot of jealousy, a great deal of complicated situations arose because of that. BASHIR: At this early stage in your marriage, what role did you see for yourself as Princess of Wales? Did you have an idea of the role that you might like to fulfil? DIANA: No, I was very confused by which area I should go into. Then I found myself being more and more involved with people who were rejected by society - with, I'd say, drug addicts, alcoholism, battered this, battered that - and I found an affinity there. And I respected very much the honesty I found on that level with people I met, because in hospices, for instance, when people are dying they're much more open and more vulnerable, and much more real than other people. And I appreciated that. BASHIR: Had the Palace given any thought to the role that you might have as Princess of Wales? DIANA: No, no one sat me down with a piece of paper and said: `This is what is expected of you.' But there again, I'm lucky enough in the fact that I have found my role, and I'm very conscious of it, and I love being with people. BASHIR: So you very much created the role that you would pursue for yourself really? That was what you did? DIANA: I think so. I remember when I used to sit on hospital beds and hold people's hands, people used to be sort of shocked because they said they'd never seen this before, and to me it was quite a normal thing to do. And when I saw the reassurance that an action like that gave, I did it everywhere, and will always do that. BASHIR: It wasn't long after the wedding before you became pregnant. What was your reaction when you learnt that the child was a boy? DIANA: Enormous relief. I felt the whole country was in labour with me. Enormous relief. But I had actually known William was going to be a boy, because the scan had shown it, so it caused no surprise. BASHIR: Had you always wanted to have a family? DIANA: Yes, I came from a family where there were four of us, so we had enormous fun there. And then William and Harry arrived - fortunately two boys, it would have been a little tricky if it had been two girls - but that in itself brings the responsibilities of bringing them up, William's future being as it is, and Harry like a form of a back-up in that aspect. BASHIR: How did the rest of the Royal Family react when they learnt that the child that you were to have was going to be a boy? DIANA: Well, everybody was thrilled to bits. It had been quite a difficult pregnancy - I hadn't been very well throughout it - so by the time William arrived it was a great relief because it was all peaceful again, and I was well for a time. Then I was unwell with post-natal depression, which no one ever discusses, post-natal depression, you have to read about it afterwards, and that in itself was a bit of a difficult time. You'd wake up in the morning feeling you didn't want to get out of bed, you felt misunderstood, and just very, very low in yourself. BASHIR: Was this completely out of character for you? DIANA: Yes, very much so. I never had had a depression in my life. BASHIR: So what treatment did you actually receive? DIANA: I received a great deal of treatment, but I knew in myself that actually what I needed was space and time to adapt to all the different roles that had come my way. I knew I could do it, but I needed people to be patient and give me the space to do it. BASHIR: When you say all of the different roles that had come your way, what do you mean? DIANA: Well, it was a very short space of time: in the space of a year my whole life had changed, turned upside down, and it had its wonderful moments, but it also had challenging moments. And I could see where the rough edges needed to be smoothed. BASHIR: What was the family's reaction to your post-natal depression? DIANA: Well maybe I was the first person ever to be in this family who ever had a depression or was ever openly tearful. And obviously that was daunting, because if you've never seen it before how do you support it? BASHIR: What effect did the depression have on your marriage? DIANA: Well, it gave everybody a wonderful new label - Diana's unstable and Diana's mentally unbalanced. And unfortunately that seems to have stuck on and off over the years. BASHIR: Are you saying that that label stuck within your marriage? DIANA: I think people used it and it stuck, yes. BASHIR: According to press reports, it was suggested that it was around this time things became so difficult that you actually tried to injure yourself. DIANA: Mmm. When no one listens to you, or you feel no one's listening to you, all sorts of things start to happen. For instance you have so much pain inside yourself that you try and hurt yourself on the outside because you want help, but it's the wrong help you're asking for. People see it as crying wolf or attention-seeking, and they think because you're in the media all the time you've got enough attention, inverted commas. But I was actually crying out because I wanted to get better in order to go forward and continue my duty and my role as wife, mother, Princess of Wales. So yes, I did inflict upon myself. I didn't like myself, I was ashamed because I couldn't cope with the pressures. BASHIR: What did you actually do? DIANA: Well, I just hurt my arms and my legs; and I work in environments now where I see women doing similar things and I'm able to understand completely where they're coming from. BASHIR: What was your husband's reaction to this, when you began to injure yourself in this way? DIANA: Well, I didn't actually always do it in front of him. But obviously anyone who loves someone would be very concerned about it. BASHIR: Did he understand what was behind the physical act of hurting yourself, do you think? DIANA: No, but then not many people would have taken the time to see that. BASHIR: Were you able to admit that you were in fact unwell, or did you feel compelled simply to carry on performing as the Princess of Wales? DIANA: I felt compelled to perform. Well, when I say perform, I was compelled to go out and do my engagements and not let people down and support them and love them. And in a way by being out in public they supported me, although they weren't aware just how much healing they were giving me, and it carried me through. BASHIR: But did you feel that you had to maintain the public image of a successful Princess of Wales? DIANA: Yes I did, yes I did. BASHIR: The depression was resolved, as you say, but it was subsequently reported that you suffered bulimia. Is that true? DIANA: Yes, I did. I had bulimia for a number of years. And that's like a secret disease. You inflict it upon yourself because your self-esteem is at a low ebb, and you don't think you're worthy or valuable. You fill your stomach up four or five times a day - some do it more - and it gives you a feeling of comfort. It's like having a pair of arms around you, but it's temporarily, temporary. Then you're disgusted at the bloatedness of your stomach, and then you bring it all up again. And it's a repetitive pattern which is very destructive to yourself. BASHIR: How often would you do that on a daily basis? DIANA: Depends on the pressures going on. If I'd been on what I call an awayday, or I'd been up part of the country all day, I'd come home feeling pretty empty, because my engagements at that time would be to do with people dying, people very sick, people's marriage problems, and I'd come home and it would be very difficult to know how to comfort myself having been comforting lots of other people, so it would be a regular pattern to jump into the fridge. It was a symptom of what was going on in my marriage. I was crying out for help, but giving the wrong signals, and people were using my bulimia as a coat on a hanger: they decided that was the problem - Diana was unstable. BASHIR: Instead of looking behind the symptom at the cause. BASHIR: What was the cause? DIANA: The cause was the situation where my husband and I had to keep everything together because we didn't want to disappoint the public, and yet obviously there was a lot of anxiety going on within our four walls. BASHIR: Do you mean between the two of you? BASHIR: And so you subjected yourself to this phase of bingeing and vomiting? DIANA: You could say the word subjected, but it was my escape mechanism, and it worked, for me, at that time. BASHIR: Did you seek help from any other members of the Royal Family? DIANA: No. You, you have to know that when you have bulimia you're very ashamed of yourself and you hate yourself, so - and people think you're wasting food - so you don't discuss it with people. And the thing about bulimia is your weight always stays the same, whereas with anorexia you visibly shrink. So you can pretend the whole way through. There's no proof. BASHIR: When you say people would think you were wasting food, did anybody suggest that to you? DIANA: Oh yes, a number of times. DIANA: Well, it was just, `I suppose you're going to waste that food later on?' And that was pressure in itself. And of course I would, because it was my release valve. BASHIR: How long did this bulimia go on for? DIANA: A long time, a long time. But I'm free of it now. BASHIR: Two years, three years? DIANA: Mmm. A little bit more than that. BASHIR: According to reports in the national press, it was at around this time that you began to experience difficulties in your marriage, in your relationship to the Prince of Wales. Is that true? DIANA: Well, we were a newly-married couple, so obviously we had those pressures too, and we had the media, who were completely fascinated by everything we did. And it was difficult to share that load, because I was the one who was always pitched out front, whether it was my clothes, what I said, what my hair was doing, everything - which was a pretty dull subject, actually, and it's been exhausted over the years - when actually what we wanted to be, what we wanted supported was our work, and as a team. BASHIR: What effect did the press interest in you have on your marriage? DIANA: It made it very difficult, because for a situation where it was a couple working in the same job - we got out the same car, we shook the same hand, my husband did the speeches, I did the handshaking - so basically we were a married couple doing the same job, which is very difficult for anyone, and more so if you ve got all the attention on you. We struggled a bit with it, it was very difficult; and then my husband decided that we do separate engagements, which was a bit sad for me, because I quite liked the company. But, there again, I didn't have the choice. BASHIR: So it wasn't at your request that you did that on your own? DIANA: Not at all, no. BASHIR: The biography of the Prince of Wales written by Jonathan Dimbleby, which as you know was published last year, suggested that you and your husband had very different outlooks, very different interests. Would you agree with that? DIANA: No. I think we had a great deal of interest - we both liked people, both liked country life, both loved children, work in the cancer field, work in hospices. But I was portrayed in the media at that time, if I remember rightly, as someone, because I hadn't passed any O-levels and taken any A-levels, I was stupid. And I made the grave mistake once of saying to a child I was thick as a plank, in order to ease the child's nervousness, which it did. But that headline went all round the world, and I rather regret saying it. BASHIR: The Prince of Wales, in the biography, is described as a great thinker, a man with a tremendous range of interests. What did he think of your interests? DIANA: Well, I don't think I was allowed to have any. I think that I've always been the 18-year-old girl he got engaged to, so I don't think I've been given any credit for growth. And, my goodness, I've had to grow. BASHIR: Explain what you mean when you say that. BASHIR: When you say, when you say you were never given any credit, what do you mean? 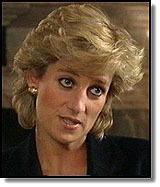 DIANA: Well anything good I ever did nobody ever said a thing, never said, `well done', or `was it OK?' But if I tripped up, which invariably I did, because I was new at the game, a ton of bricks came down on me. BASHIR: How did you cope with that? DIANA: Well obviously there were lots of tears, and one could dive into the bulimia, into escape. BASHIR: Some people would find that difficult to believe, that you were left so much to cope on your own, and that the description you give suggests that your relationship with your husband was not very good even at that early stage. DIANA: Well, we had unique pressures put upon us, and we both tried our hardest to cover them up, but obviously it wasn't to be. BASHIR: Around 1986, again according to the biography written by Jonathan Dimbleby about your husband, he says that your husband renewed his relationship with Mrs Camilla Parker-Bowles. Were you aware of that? DIANA: Yes I was, but I wasn't in a position to do anything about it. BASHIR: What evidence did you have that their relationship was continuing even though you were married? DIANA: Oh, a woman's instinct is a very good one. DIANA: Well, I had, obviously I had knowledge of it. DIANA: Well, from people who minded and cared about our marriage, yes. BASHIR: What effect did that have on you? DIANA: Pretty devastating. Rampant bulimia, if you can have rampant bulimia, and just a feeling of being no good at anything and being useless and hopeless and failed in every direction. BASHIR: And with a husband who was having a relationship with somebody else? DIANA: With a husband who loved someone else, yes. BASHIR: You really thought that? DIANA: Uh,uh. I didn't think that, I knew it. BASHIR: How did you know it? DIANA: By the change of behavioural pattern in my husband; for all sorts of reasons that a woman's instinct produces; you just know. It was already difficult, but it became increasingly difficult. BASHIR: In the practical sense, how did it become difficult? DIANA: Well, people were - when I say people I mean friends, on my husband's side - were indicating that I was again unstable, sick, and should be put in a home of some sort in order to get better. I was almost an embarrassment. BASHIR: Do you think he really thought that? DIANA: Well, there's no better way to dismantle a personality than to isolate it. BASHIR: So you were isolated? DIANA: Uh,uh, very much so. BASHIR: Do you think Mrs Parker-Bowles was a factor in the breakdown of your marriage? DIANA: Well, there were three of us in this marriage, so it was a bit crowded. BASHIR: You're effectively living separate lives, yet in public there's this appearance of this happily married royal couple. How was this regarded by the Royal Family? DIANA: I think everybody was very anxious because they could see there were complications but didn't want to interfere, but were there, made it known that they were there if required. BASHIR: Do you think it was accepted that one could live effectively two lives - one in private and one in public? DIANA: No, because again the media was very interested about our set-up, inverted commas; when we went abroad we had separate apartments, albeit we were on the same floor, so of course that was leaked, and that caused complications. But Charles and I had our duty to perform, and that was paramount. BASHIR: So in a sense you coped with this, these two lives, because of your duty? DIANA: Uh,uh. And we were a very good team in public; albeit what was going on in private, we were a good team. BASHIR: Some people would find that difficult to reconcile. DIANA: Well, that's their problem. I know what it felt like. BASHIR: The Queen described 1992 as her `annus horribilis', and it was in that year that Andrew Morton's book about you was published. Did you ever meet Andrew Morton or personally help him with the book? DIANA: I never met him, no. BASHIR: Did you ever personally assist him with the writing of his book? DIANA: A lot of people saw the distress that my life was in, and they felt it was a supportive thing to help in the way that they did. BASHIR: Did you allow your friends, your close friends, to speak to Andrew Morton? DIANA: Yes, I did. Yes, I did. DIANA: I was at the end of my tether. I was desperate. I think I was so fed up with being seen as someone who was a basket-case, because I am a very strong person and I know that causes complications in the system that I live in. BASHIR: How would a book change that? DIANA: I don't know. Maybe people have a better understanding, maybe there's a lot of women out there who suffer on the same level but in a different environment, who are unable to stand up for themselves because their self-esteem is cut into two. I don't know. BASHIR: What effect do you think the book had on your husband and the Royal Family? DIANA: I think they were shocked and horrified and very disappointed. BASHIR: Can you understand why? 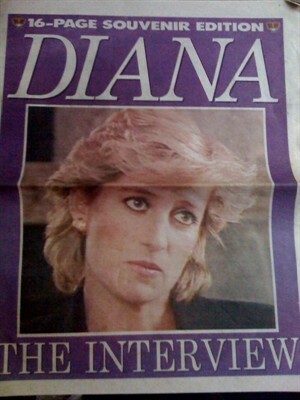 DIANA: I think Mr Dimbleby's book was a shock to a lot of people and disappointment as well. BASHIR: What effect did Andrew Morton's book have on your relationship with the Prince of Wales? DIANA: Well, what had been hidden - or rather what we thought had been hidden - then became out in the open and was spoken about on a daily basis, and the pressure was for us to sort ourselves out in some way. BASHIR: What happened after the book was published? DIANA: Well, we struggled along. We did our engagements together. And in our private life it was obviously turbulent. BASHIR: Did things come to a head? DIANA: Yes, slowly, yes. My husband and I, we discussed it very calmly. DIANA: So we got the lawyers together, we discussed separation - obviously there were a lot of people to discuss it with: the Prime Minister, Her Majesty - and then it moved itself, so to speak. BASHIR: By the December of that year, as you say, you'd agreed to a legal separation. What were your feelings at the time? DIANA: Deep, deep, profound sadness. Because we had struggled to keep it going, but obviously we'd both run out of steam. BASHIR: It was not your idea? DIANA: No. Not at all. I come from a divorced background, and I didn't want to go into that one again. DIANA: We, I asked my husband if we could put the announcement out before the children came back from school for Christmas holidays because they were protected in the school they were at. BASHIR: Did you tell your children that you were going to separate? DIANA: Yes. I went down a week beforehand, and explained to them what was happening. BASHIR: What effect do you think the announcement had on them? DIANA: I think the announcement had a huge effect on me and Charles, really, and the children were very much out of it, in the sense that they were tucked away at school. BASHIR: Once the separation had occurred, moving to 1993, what happened during that period? DIANA: People's agendas changed overnight. I was now separated wife of the Prince of Wales, I was a problem, I was a liability (seen as), and how are we going to deal with her? This hasn't happened before. BASHIR: Who was asking those questions? DIANA: People in my environment, yes, yes. BASHIR: And they began to see you as a problem? DIANA: Yes, very much so, uh,uh. BASHIR: How did that show itself? DIANA: By visits abroad being blocked, by things that had come naturally my way being stopped, letters going, that got lost, and various things. BASHIR: So despite the fact that your interest was always to continue with your duties, you found that your duties were being held from you? DIANA: Yes. Everything changed after we separated, and life became very difficult then for me. BASHIR: Who was behind that change? DIANA: Well, my husband's side were very busy stopping me. BASHIR: What was your reaction when news broke of allegedly a telephone conversation between you and Mr James Gilbey having been recorded? DIANA: I felt very protective about James because he'd been a very good friend to me and was a very good friend to me, and I couldn't bear that his life was going to be messed up because he had the connection with me. BASHIR: Did you have the alleged telephone conversation? DIANA: Yes we did, absolutely we did. Yup, we did. BASHIR: On that tape, Mr Gilbey expresses his affection for you. Was that transcript accurate? DIANA: Yes. I mean he is a very affectionate person. BASHIR: Have you any idea how that conversation came to be published in the national press? DIANA: No, but it was done to harm me in a serious manner, and that was the first time I'd experienced what it was like to be outside the net, so to speak, and not be in the family. BASHIR: What do you think the purpose was behind it? DIANA: It was to make the public change their attitude towards me. BASHIR: There were also a series of telephone calls which allegedly were made by you to a Mr Oliver Hoare. Did you make what were described as nuisance phone calls? DIANA: I was reputed to have made 300 telephone calls in a very short space of time which, bearing in mind my lifestyle at that time, made me a very busy lady. BASHIR: Had you made any of those calls at all? DIANA: I used to, yes, I had rung up, yes. BASHIR: Once, twice, three times? DIANA: I don't know. Over a period of six to nine months, a few times, but certainly not in an obsessive manner, no. BASHIR: Do you really believe that a campaign was being waged against you? DIANA: Yes I did, absolutely, yeah. DIANA: I was the separated wife of the Prince of Wales, I was a problem, fullstop. Never happened before, what do we do with her? BASHIR: Can't we pack her off to somewhere quietly rather than campaign against her? DIANA: She won't go quietly, that's the problem. I'll fight to the end, because I believe that I have a role to fulfil, and I've got two children to bring up. BASHIR: By the end of 1993 you had suffered persistent difficulties with the press - these phone conversations were made public - and you decided to withdraw from public life. Why did you do that? DIANA: The pressure was intolerable then, and my job, my work was being affected. BASHIR: It wasn't very long before you did come back, of course. DIANA: Well, I don't know. I mean, I did a lot of work, well, underground, without any media attention, so I never really stopped doing it. BASHIR: Who was the enemy? DIANA: Well, the enemy was my husband's department, because I always got more publicity, my work was more, was discussed much more than him. BASHIR: But you really believe that it was out of jealousy that they wanted to undermine you? DIANA: I think it was out of fear, because here was a strong woman doing her bit, and where was she getting her strength from to continue? BASHIR: What was your reaction to your husband's disclosure to Jonathan Dimbleby that he had in fact committed adultery? DIANA: Well, I was totally unaware of the content of the book, and actually saw it on the news that night that it had come out, and my first concern was to the children, because they were able to understand what was coming out, and I wanted to protect them. DIANA: Well, to be honest about a relationship with someone else, in his position - that's quite something. BASHIR: How did you handle this with the children? DIANA: I went to the school and put it to William, particularly, that if you find someone you love in life you must hang on to it and look after it, and if you were lucky enough to find someone who loved you then one must protect it. BASHIR: What effect do you think it had on Prince William? DIANA: Well, he's a child that's a deep thinker, and we don't know for a few years how it's gone in. But I put it in gently, without resentment or any anger. BASHIR: Looking back now, do you feel at all responsible for the difficulties in your marriage? DIANA: Mmm. I take full responsibility, I take some responsibility that our marriage went the way it did. I'll take half of it, but I won't take any more than that, because it takes two to get in this situation. BASHIR: But you do bear some of the responsibility? DIANA: Absolutely, we both made mistakes. BASHIR: Another book that was published recently concerned a Mr James Hewitt, in which he claimed to have had a very close relationship with you, from about 1989 I think. What was the nature of your relationship? DIANA: He was a great friend of mine at a very difficult, yet another difficult time, and he was always there to support me, and I was absolutely devastated when this book appeared, because I trusted him, and because, again, I worried about the reaction on my children. BASHIR: What do you mean? DIANA: Well, there was a lot of fantasy in that book, and it was very distressing for me that a friend of mine, who I had trusted, made money out of me. I really minded about that. BASHIR: Did your relationship go beyond a close friendship? DIANA: Yes it did, yes. DIANA: Yes, I adored him. Yes, I was in love with him. But I was very let down. BASHIR: How would you describe your life now? You do live very much on your own, don't you? BASHIR: What do you mean by that? DIANA: Well, I mean any gentleman that's been past my door, we've instantly been put together in the media and all hell's broken loose, so that's been very tough on the male friends I've had, and obviously from my point of view. BASHIR: Does that mean that you feel that for the rest of your life you'll have to be on your own? DIANA: No, I'm not really on my own. I've got wonderful friends, I've got my boys, I've got my work. BASHIR: How do you feel about the way the press behaves towards you now? DIANA: I still to this day find the interest daunting and phenomenal, because I actually don't like being the centre of attention. And, you know, you can laugh it off. But you get that the whole time. It's quite difficult. BASHIR: Some people would say that in the early years of your marriage you were partly responsible for encouraging the press interest - you danced with people like Wayne Sleep, you seemed to enjoy it, you had a very good and warm relationship. DIANA: I've never encouraged the media. There was a relationship which worked before, but now I can't tolerate it because it's become abusive and it's harassment. And each time one enjoys oneself - albeit it's in a different situation - you have to pay for it, because people criticise, which comes with the patch, as I said previously. BASHIR: But here at Kensington Palace, are you isolated? DIANA: Well I am by the nature of my situation, yes, but I don't feel sorry for myself in any way. BASHIR: What role do you see for yourself in the future? DIANA: I'd like to be an ambassador for this country. I'd like to represent this country abroad. BASHIR: You say you feel that your future is as some form of ambassador. At whose behest is that? On what grounds do you feel that you have the right to think of yourself as an ambassador. DIANA: I've been in a privileged position for 15 years. I've got tremendous knowledge about people and how to communicate. I've learnt that, I've got it, and I want to use it. BASHIR: Do you think that the British people are happy with you in your role? DIANA: I think the British people need someone in public life to give affection, to make them feel important, to support them, to give them light in their dark tunnels. BASHIR: Do you think you can? DIANA: I know I can, I know I can, yes. BASHIR: Up until you came into this family, the monarchy seemed to enjoy an unquestioned position at the heart of British life. Do you feel that you're at all to blame for the fact that survival of the monarchy is now a question that people are asking? DIANA: No, I don't feel blame. I mean, once or twice I've heard people say to me that, you know, `Diana's out to destroy the monarchy', which has bewildered me, because why would I want to destroy something that is my children's future. BASHIR: When you say indifferent, what do you mean? DIANA: They don't care. People don't care any more. They've been so force-fed with marital problems, whatever, whatever, whatever, that they're fed up. BASHIR: Do you think the monarchy needs to adapt and to change in order to survive? DIANA: I understand that change is frightening for people, especially if there's nothing to go to. It's best to stay where you are. I understand that. BASHIR: What are you doing to try and effect some kind of change? DIANA: Well, with William and Harry, for instance, I take them round homelessness projects, I ve taken William and Harry to people dying of Aids - albeit I told them it was cancer - I ve taken the children to all sorts of areas where I'm not sure anyone of that age in this family has been before. BASHIR: What are you hoping that that experience for your children - what impact that experience will have on your children? DIANA: I want them to have an understanding of people's emotions, people's insecurities, people's distress, and people's hopes and dreams. BASHIR: What kind of monarchy do you anticipate? DIANA: I would like a monarchy that has more contact with its people - and I don't mean by riding round bicycles and things like that, but just having a more in-depth understanding. BASHIR: There's a lot of discussion at the moment about how matters between yourself and the Prince of Wales will be resolved. There's even the suggestion of a divorce between you. What are your thoughts about that? DIANA: I don't want a divorce, but obviously we need clarity on a situation that has been of enormous discussion over the last three years in particular. BASHIR: If he wished a divorce to go through, would you accept that? DIANA: I would obviously discuss it with him, but up to date neither of us has discussed this subject, though the rest of the world seems to have. BASHIR: Would it be your wish to divorce? DIANA: No, it's not my wish. BASHIR: Why? Wouldn't that resolve matters? DIANA: Why would it resolve matters? BASHIR: It would provide the clarity that you talk about, it would resolve matters as far as the public are concerned perhaps. DIANA: Yes, but what about the children? Our boys - that's what matters, isn't it? BASHIR: Do you think that because of the way you behave that's precluded you effectively from becoming Queen? DIANA: Yes, well not precluded me. I wouldn't say that. I just don't think I have as many supporters in that environment as I did. BASHIR: You mean within the Royal Household? DIANA: Uh,uh. They see me as a threat of some kind, and I'm here to do good: I'm not a destructive person. BASHIR: Why do they see you as a threat? DIANA: I think every strong woman in history has had to walk down a similar path, and I think it's the strength that causes the confusion and the fear. BASHIR: Do you think the Prince of Wales will ever be King? DIANA: I don't think any of us know the answer to that. And obviously it's a question that's in everybody's head. But who knows, who knows what fate will produce, who knows what circumstances will provoke? DIANA: There was always conflict on that subject with him when we discussed it, and I understood that conflict, because it's a very demanding role, being Prince of Wales, but it's an equally more demanding role being King. DIANA: Well, then you have to see that William's very young at the moment, so do you want a burden like that to be put on his shoulders at such an age? So I can't answer that question. BASHIR: Why have you decided to give this interview now? Why have you decided to speak at this time? DIANA: Because we will have been separated three years this December, and the perception that has been given of me for the last three years has been very confusing, turbulent, and in some areas I'm sure many, many people doubt me. BASHIR: And so you feel that by speaking out in this way you'll be able to reassure the people? DIANA: Uh,uh. The people that matter to me - the man on the street, yup, because that's what matters more than anything else. BASHIR: Some people might think - some people might interpret this as you simply taking the opportunity to get your own back on your husband. DIANA: I don't sit here with resentment: I sit here with sadness because a marriage hasn't worked.